With the cooler weather coming, I have to admit, I am in the mood to feather, freshen, and make things a little more cozy in our home. I look forward to the Autumn season each year! I love to decorate on a shoestring budget. 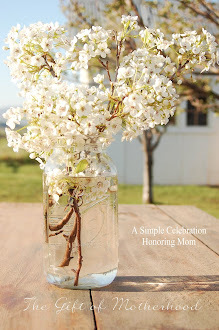 Most things in our home are yard sale finds, hand me downs...or handmade! The colors are a warm, yet neutral. I think I would describe my style as simplistic with a "prairie meets the cottage" twist. 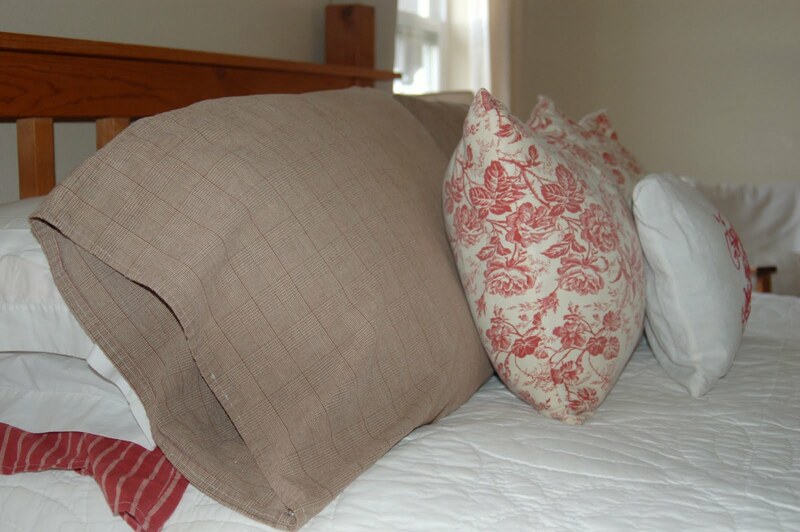 I bought the linen pillow from Mary Jane's Farm Fair in the Palouse area of Washington. How I LOVE her magazines, books, and website! I have even had the privilege of meeting her in person. 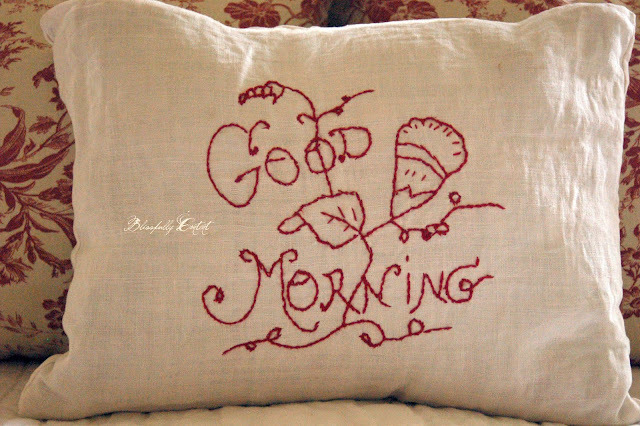 Morning is our favorite time of the day, so the pillow is perfect on our bed. 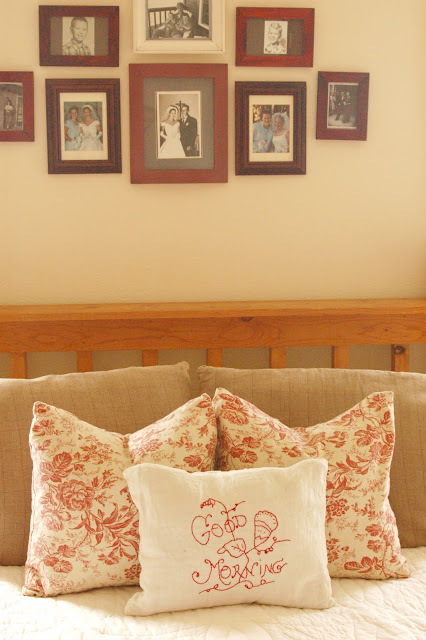 My Aunt Barbara gave me the fabric for the pillow cases, and the red and white flower pattern is from Joann Fabrics. The white quilt is from Goodwill. I think I paid $12! The drapes are made from drop cloths. So cheap and yards of fabric for a fraction of the cost. At the foot of the bed is one of my real treasures. 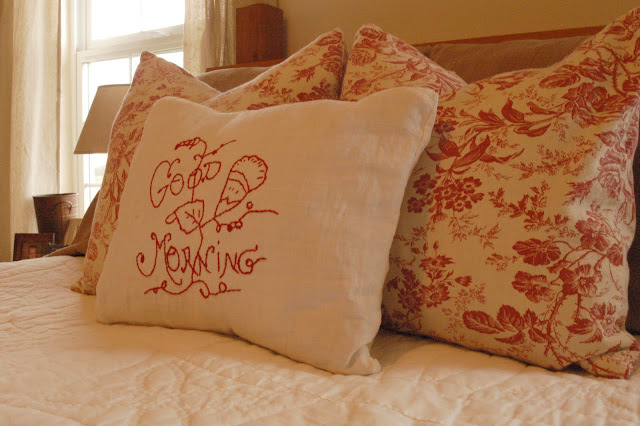 Darren's Grandmother crocheted this beautiful coverlet for his parents when they married. It must have taken her months and months. Her workmanship is absolutely amazing. I feel so lucky to have possession of this heirloom. I made the bed with my Dad before going away to college. I have such fond memories of building it. I like that it is slightly imperfect, a little rough, but beautiful at the same time. At the foot of the bed, is a little extra seating. 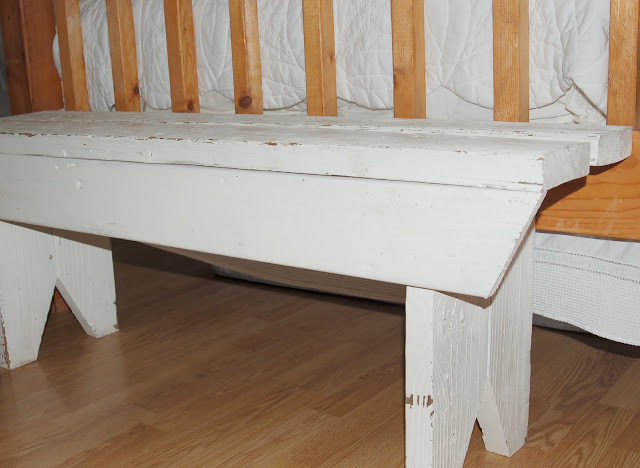 I made this barn wood bench and painted it a distressed white. We use it at the kitchen table to expand seating when we have guests. 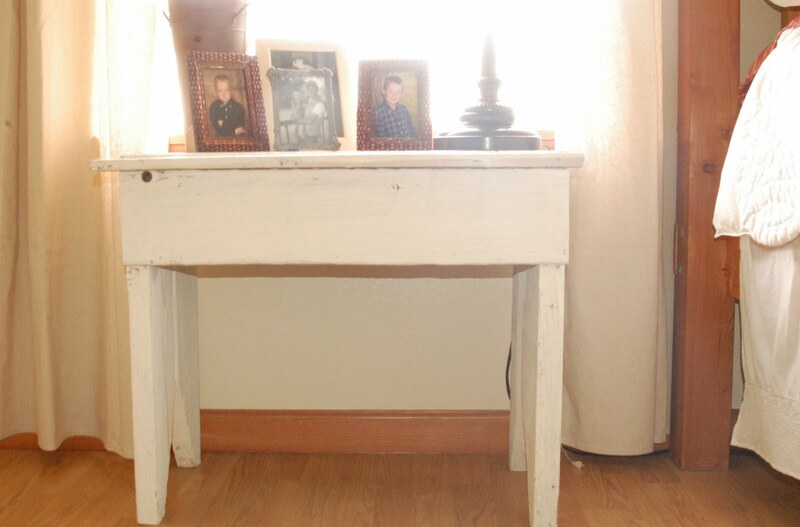 The side tables are barn wood, too. They are not exactly what I would dream of having, but suit the job just fine, and were simple to make. I continued with a distressed white finish. They are perfect for the $5 swinging lamps I found at a yard sale this year that make reading so easy in bed:). I also display a lot of family pictures on the bedside tables. I like to wake up and see the faces of those I love. I even arrange them above our bed. I hope you have enjoyed the little tour:). I love how peaceful and meaningful your bedroom is. Love the matching reading lamps too! sweet and beautiful. Thank you for sharing. 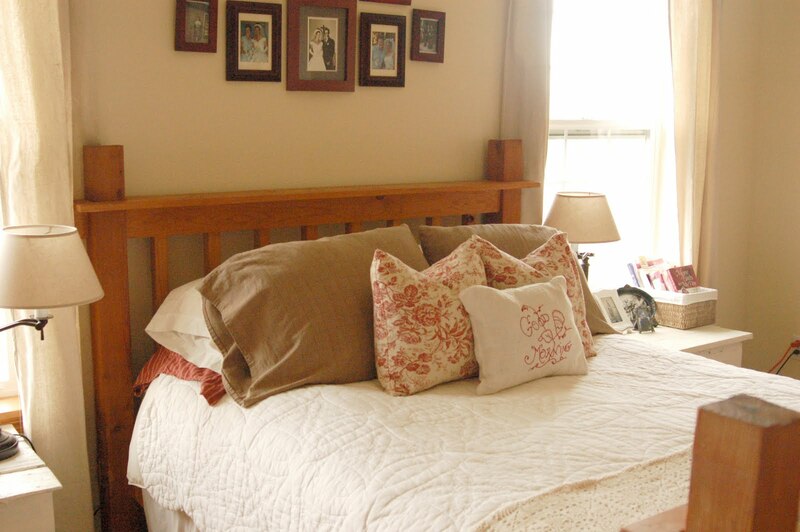 LOVE the idea of pictures above the bed like that and what a treasure that afghan is. I just had to comment and say I love, love coming here...so much beauty and peace!